The National U.S.-Arab Chamber of Commerce (NUSACC) today helped to open the USA Pavilion at the Baghdad International Fair in the Republic of Iraq. David Hamod, President & CEO of the U.S.-Arab Chamber, joined the Honorable James F. Jeffrey, U.S. 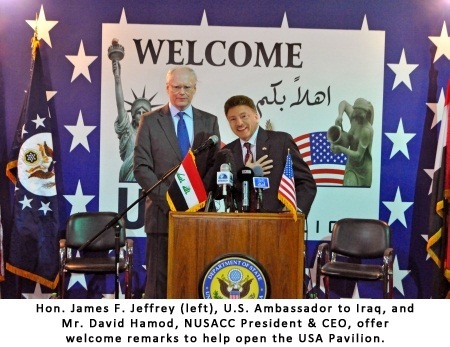 Ambassador to Iraq, in offering welcome remarks immediately after a ribbon-cutting ceremony that officially launched the USA Pavilion. Cutting the ceremonial ribbon was H.E. 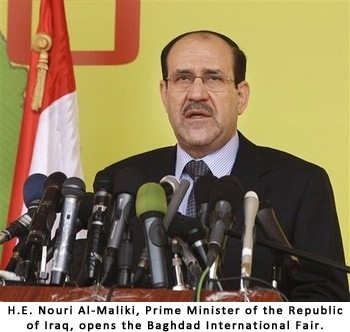 Nouri Al-Maliki, Prime Minister of Iraq and Ambassador Jeffrey. Ambassador Jeffrey noted, "Today is not only a big step forward for American-Iraqi trade relations, it's a big step forward for Iraq's opening to the entire world after thirty years of war, thirty years of dictatorship. Iraq is becoming a very important part of this region and the entire global community." The U.S. Ambassador highlighted some of the initiatives that have been taken under the auspices of the 2008 Strategic Framework Agreement, which focuses on developing the Iraqi economy and promoting engagement between Iraq and the United States through education and travel. He emphasized that the United States is "committed to working together with the government and people of Iraq towards closer relations and better cooperation on a variety of economic, energy and other issues." The USA Pavilion -- organized by the U.S. Department of Commerce -- represents the first participation by the United States at the Fair in over twenty years, and it showcases 85 U.S. businesses, universities, travel and tourism organizations, and government programs. Some of the sectors represented by U.S. companies at the Fair include aviation & aeronautics, banking & financial services, construction & engineering, defense & security, education, information & communications technologies (ICT), healthcare, infrastructure, logistics, and transportation. General Motors, for example, is giving away a free Chevrolet Malibu at the USA Pavilion to a lucky Iraqi family. ​More than one million Iraqis are expected to attend this year's event, the 38th session of the Baghdad International Fair. Organized under the auspices of the State Company for Iraqi Fairs and Commercial Services, the Fair dates back to the 1980s, making it one of the oldest and largest events of its kind in the Arab world. Thirteen nations are participating in this year's event. According to research conducted by the National U.S.-Arab Chamber of Commerce, Iraq is on track to become the fourth largest destination in the Arab world for U.S. goods and services by the year 2013. Exports of U.S. merchandise to Iraq are expected to grow from $1.6 billion last year to $4.4 billion in 2013, expanding U.S. market share in Iraq from seven percent to 20 percent. In the same vein, U.S. services are on track to grow from $1.6 billion last year to over $4 billion by 2013, representing a growth in market share from just over 17 percent to 24 percent. NUSACC, in addition to playing a role in opening the USA Pavilion, maintained a booth at the Fair – the first time in memory that the National U.S.-Arab Chamber of Commerce has displayed its wares at an international fair. The booth received hundreds of visitors on opening day, and many thousands of visitors are expected to visit NUSACC in the days ahead. The U.S.-Arab Chamber, noted President & CEO David Hamod, is "well positioned to serve as a partner in Iraq's future endeavors. Our Chamber has hosted more Iraqi private sector delegations in the United States than any other business entity in America, to the best of our knowledge, and we look forward to hosting many more such delegations in the future, InShaAllah." Click here for more information on the USA Pavilion.